The following blog article is courtesy of Kaela Vronsky, mentoring and National Center director for Partners for Youth with Disabilities, Inc.
Did you know that one in five Americans has a disability, most of which are invisible? Youth with disabilities are everywhere, and yet they often lack access to the same resources as their typically developing peers. These young people drop out of high school at twice the rate of those without, are three times more likely to get involved with the juvenile justice system, and are at significantly greater risk of being unemployed and living in poverty than their typically abled counterparts. 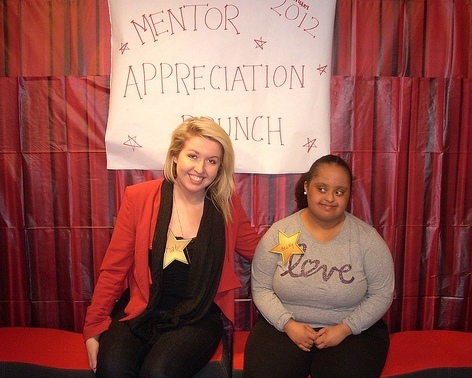 [caption id="attachment_792" align="alignleft" width="300" caption="A PYD match from Mentor Appreciation Day 2012 in January"] [/caption]Partners for Youth with Disabilities (PYD) has been addressing these disparities since 1985 through one-on-one, group, and peer mentoring. In 2005, PYD’s National Center for Mentoring Youth with Disabilities was founded in response to inquiries received over the years from other organizations looking to receive training to better serve youth with disabilities. The National Center has presented at numerous local and national conferences and trained agencies such as AFC Mentoring, Girl Scouts, City Year, Boys and Girls Clubs, and others. This year, the National Center is thrilled to add Big Brothers Big Sisters of Massachusetts Bay to this list! In January of this year, PYD’s National Center received funding from the Mitsubishi Electric America Foundation to provide customized, in-depth training to Big Brothers Big Sisters of Massachusetts Bay, and Big Brothers Big Sisters of Western New Hampshire with the purpose of building their awareness and capacity to effectively serve current and future participants with disabilities. The training agenda includes an overview of inclusion, disability etiquette and communication, and programmatic tips for inclusive mentoring. PYD will use this experience to create a model that will be relevant and replicable to Big Brother Big Sister programs throughout the country. For more information, go to www.pyd.org, or call Kaela Vronsky at 617-556-4075, ext. 14.